Beauty products of the month for detox and hydration. Thanks to my medical background and experience, I have some knowledge about beauty products, skin care routine and treatments. Thus, I would be happy to share this interesting information with you. I HAVE SOME EVALUATION CRITERIA FOR THE BRANDS I USE. THEY SHOULD focus on specific needs of the skin, PARTICIPATE IN THE DERMATOLOGICAL AND COSMETOLOGICAL RESEARCHES, CONTAIN EFFECTIVE FORMULAS AND INGREDIENTS OF THE HIGHEST STANDARDS AND QUALITY. This month, we are talking about hydration, oxygenation and detox. With age, our skin is facing a lot of different problems, and some of them are dehydration and glycoxidation processes. Hydration of the skin depends on the proper amount of the water captors on the surface, like the NMF and epidermal lipids, as well as within the dermis, like glycoproteins with the main role to hyaluronic acid. Water is the major plasticizer of the skin, so when there is a defect in the permeability, the skin loses water and gets thin, weak, sometimes even cracks occur. This condition is called dehydration. It’s important to reestablish the water level, and keep the skin nourishing. Fortunately, we have a lot of products that can help us with that. Glycoxidation is a process when sugar damages the skin’s proteins by binding to them and producing glycotoxins. As a result, the cells metabolism and cell renewal are slowing down, dermal fibres are defecting and toxins are cumulating in the cells, causing loss of firmness, irregular skin texture and dull complexion. Luckily, we also have good treatments and products to fight with this process. For the best results from any good cosmetic products, your skin care routine should become a daily habit, in the morning and in the evening. Don’t get upset, if you won’t see dramatic changes on the skin after a few days of using your products. The first real results be visible after 1 – 1,5 month of regular routine as the skin renewal takes at least one month. Injections, surgeries, lasers and professional treatments don’t exclude your daily skin care routine. Quite the opposite, the proper home care will prolong the results from any professional treatments. Sometimes more is less. Choose carefully you basics and don’t overwhelm your skin with tones of creams. Currently, I am discovering and using products from the renowned brand – LIERAC. It is a French brand, that has an excellent reputation and 40 years of the history in the ecstatic medicine. The Lierac Laboratories are taking an active part in the dermo-cosmetological researches and studies. The brand stands for the best quality, innovative products and clear results. 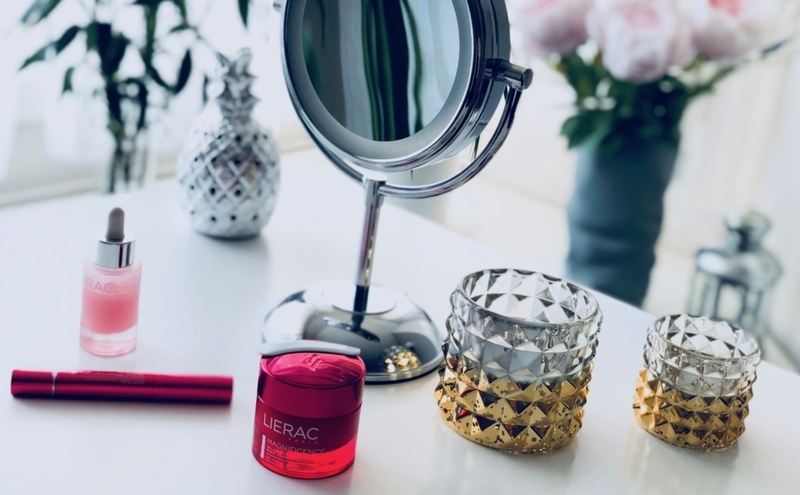 After using these lierac products daily for a one and a half month I could see the improvements: the texture more smooth and firm, the skin feels fresh and hydrated, as well as lifted. LIERAC Moisturizing Serum, Oxygenating & Re-plumping – effective for hydration, oxygenation and regeneration, thanks to its main ingredients ultra concentrated complex Hydra O 2 (15%), Natural Moisturizing Factor (10%), AHA’S (0.5%) and water-soluble vitamins. The serum rehydrates the skin, plus gives a good boost to the production of its own water captors. LIERAC Magnificence Precision Eye Care – cream for reducing puffiness and dark circles. Thanks to its patented formula that contains D-Glyox Complex (Pomegranate Flower, Silk Tree, Liposome Peptide), hyaluronic acid and Vitamines C & E, this cream smoothes the skin, reduces wrinkles and dark circles. LIERAC Magnificence Day & Night Cream-Gel – suitable for normal to combination skin. Anti-age cream-gel that helps to revitalise, firm and smooth the skin. The key ingredients of D-Glyox Complex (Pomegranate Flower, Silk Tree, Liposome Peptide) work for anti-glycoxidation and detoxifying solutions, also boosting cells metabolism. While rice powder provides a matte finish. The cream has a light texture, furthermore, it’s a great base for the make up. ALTHOUGH IT’S CONVENIENT TO USE ONE PRODUCT FOR DAY AND NIGHT, YOU SHOULD ALWAYS REMEMBER TO APPLY A SUN PROTECTION, AS THE DAY/NIGHT CREAMS MAY NOT CONTAIN A SPF. Let me know in the comments below, which cosmetic treatments or products you would be interested to learn more about. You may also learn more about skin structure -> SKIN IS NOT JUST A SURFACE. Medical Disclaimer: This web site is not designed to, and does not, provide medical advice. All content, including text, graphics, images and information available on or through this Web site are for general informational purposes only. The Content is not intended to be a substitute for professional medical advice, diagnosis or treatment. You take full legal responsibility for whatever decisions you make regarding your own health care. This material is offered solely for educational purposes. The suggestion is that you think clearly for yourself and make your own decisions, with the input of a licensed health professional should you choose to consult one. Thanks for the mention, Zach!